Like most people growing up in the world's cultural peripheries from the early Noughties onwards, the internet played a key role in Philippe Hallais' musical career. Via the medium of online forums, the would-be producer discovered an eclectic array of music from his home in a small town in Brittany, a region more famed for its culinary specialties (cheese and its production, it should be noted, remains one of his passions alongside music). 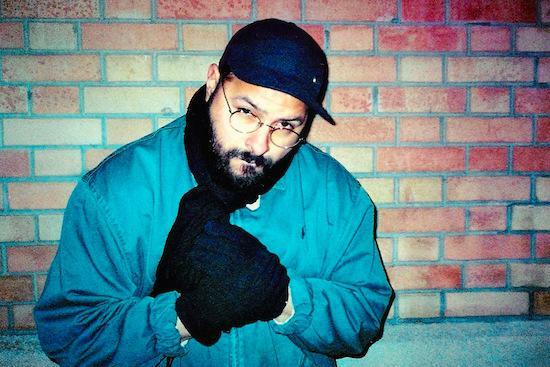 The stylistic broadness of what he was hearing here – "the first grime freestyles recorded on pirate radios, Definitive Jux, Chicago ghetto house and Detroit electro", he explains – has accompanied his work to this day, with each of his own albums featuring its own narrative, taking cues from EBM, house and techno, but always shying away from being too literal an interpretation of any. His first album, 2014's Garifuna Variations on L.I.E.S., was a percussive tour de force soaked in grainy, industrial atmospherics. Noise and its various manifestations are his staple, though again, he's never been part of any particular scene defined by its stylistic boundaries (in contrast with the importance of his immediate geographical surroundings – he's a firm part of the "new" Parisian scene, based around labels like In Paradisum). Together with Jean Carval he founded Editions Gravats, a label based in both Paris and Brittany, which released, among others, Black Zone Myth Chant's brilliant Mane Thecel Phares LP last year. His music has never been formalistic, solipsistic or superficial – rather there's an honesty that oozes from his productions. Last year's Sewing Machine was relentless and raw, jacking and merciless. Though a glance at his track titles - 'Lube Money', 'Free Pyjamas', 'Imaginary Boogie' – shows it's obvious that Hallais is not a poker-faced, black-clad artiste taking himself too seriously. Following releases on labels including Trilogy Tapes, Delsin or In Paradisum, Low Jack's latest album, out tomorrow, will be coming out on Modern Love, which might come across as a surprise after his industrial-tinged techno material. However, the path he follows on Lighthouse Stories suggests the Manchester-based imprint is a perfect fit. There are vocal samples, light-headed atmospherics and plenty of space, stemming out of elements of rave, jungle, electro, house, chill out and footwork even. But that's not to say it's a haunted longing for some halcyon past, it's also filled with playful sonic exploration and experimentation, forming an album made like a mixtape, full of memories and references, oscillating between the imaginary and the real, night and day. How do you feel that growing up with the internet and absorbing the influences you found there has impacted your musical maturation? Philippe Hallais: There was a computer with an internet connection in my bedroom when I was about 16 years old, so it organically played a massive part in my approach to music. That was around 2001 in a small town in Brittany where I grew up, with basically nothing happening except if you were interested in sailing or fishing. I got into turntablism and DMC competitions through the internet. Then I gradually started hanging out on boards, internet forums, and Soulseek chat rooms, talking to people from all around the globe. Those people introduced me to the first grime freestyles recorded on pirate radios, Definitive Jux, Chicago ghetto house and Detroit electro. Basically most of the genres that are influencing my music today came from that time when I was this geeky teenager absorbing anything I could. Can you talk about "naivety" in connection with music-making, a certain childlike approach to music that you in the past mentioned as having? PH: I'm not sure anymore if "naive" was the right word. First because I can't be the one judging if it's naive or not. But also I always try to change methods and production processes, and this affects the recording. I easily admit to having made a mistake. So it's not so much about being naive as much as the fact that I'm mindful of ending up with something very different from what was originally planned. I don't always have a clear vision of what I'm doing and whether what I'm doing is good enough. To be honest most of the time I have a bad opinion of my work. Most of the satisfaction comes from learning new ways of doing music, testing new ideas or thinking about what I could try out. So rather than something naive, it's more that I am in a constant state of doubt and I don't always know what I'm doing, to the point of lacking confidence sometimes. Nevertheless, you seem to have a playful approach to working with various musical genres, without taking them or yourself too seriously. Do you feel a certain rebellious aspect is missing from techno, house or the dance culture as such nowadays? PH: The techno and house scenes seem pretty cynical to me. It's just another business. A lot of people I meet in the scene care about things that are pretty far from the creative flourishing and they constantly justify this by saying they need to make a living. They are aware that it's a market with a great deal of financial challenges which define the rules. These rules will make them obsessed with sounding huge on a club sound system, defining the right bpm (not too fast, not too slow) and being on an infinite quest for 'the killer track': standardise everything. That being said, I have no problem with that. It's a miserable line of work, a job with an incredible amount of insecurity, so it's difficult to be judgmental. You are releasing a new album called Lighthouse Stories. What are these stories? Is there a specific narrative? Some of the tracks have explanatory titles in brackets, almost as if it was a screenplay. PH: The record echoes my teenage memories, when I was living in Brittany in a small port town. The titles relate to my friends, the places where we'd go and our inside jokes. You create this imaginary universe for yourself when you're bored and feel a bit lonely. Also I started to get interested in the stories of lighthouse keepers. They have this very lyrical style of writing in their diaries, and these accounts of loneliness move and inspire me. Compared to your previous album, Sewing Machine, Lighthouse Stories sounds like a release wrapped in cotton mist, an exhale. Was this a deliberate sound you were setting out to achieve? PH: To me, there's still a sense of noise and texture on this new album. But I needed a breath of fresh air and I tried and brought in melodies, pads and polyphonic harmonies. Though I still had dissonance and chaos in mind, with Cannibal Ox as a reference point all the while I was composing. You've mentioned that in the past you experimented with various genres and appropriated elements from them and created something of your own. Could this be applied to Lighthouse Stories, too? PH: Of course the record relates to genres that I was into as a teenager like Detroit electro, juke, abstract hip-hop and the connections to turntablism and beat-juggling. But it was more the narrative aspect that I was into, the obsessiveness of mixtapes from this time where nothing was left to chance, with every element responding to each other. To me teenage nostalgia is about extreme loneliness and the need to escape. That's what I wanted to start to grasp with Lighthouse Stories. Paris, the city that's now your home, has had its waves of electronic culture, mostly rather glitzy French house and electro, which recently seem to have shifted to the darker side, thanks to labels like In Paradisum, and now Ron Morelli and his L.I.E.S. imprint are also based there. PH: I've recently discovered fascinating French musicians, but outside of Paris, like Jean Francois Plomb or DJ David Coquelin. I think it's the same for In Paradisum, who work with French artists but actually few Parisians. I couldn't define the Parisian scene. I have good friends over here like Ron, Krikor, D.K., December, the Antinote crew, Guillaume [Heuguet] and Paul [Regimbeau] from In Paradisum and others. But it's more about human warmness, friendliness with a "bro" aspect related to the extra-musical stuff.